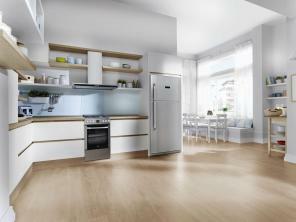 From state of art large capacity "Side-by-Side" refrigerators to simple, small under the counter fridge - freezers. The assortment of these products is exclusively wide, carefully formed by combining contemporary design and advanced technologies which ensure a long, smooth and efficient performance of refrigerators or refrigerators - freezers. 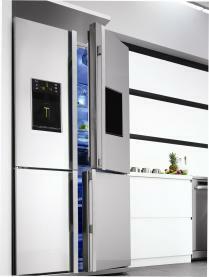 Frost free system: intended to eliminate the formation of ice on food and within the interior of appliance. This system not only makes refrigerator hassle free and easy to use, but also maintains the right temperature for optimal food storage. 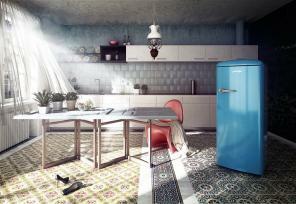 Refrigerators or refrigerators - freezers of different brands sometimes are distinguished by advanced frost free cooling systems such as "Beko" "Active Dual Cooling" (independent refrigerator and freezer cooling systems, air circulates separately in both compartments) and "NeoFrost" (more stable and faster cooling, more humidity), "Blomberg", "Gorenje", "Snaigė" – "No Frost" which ensures better circulation of the cool air, removes humidity and guarantees that food kept in this kind of refrigerator or refrigerator - freezer will stay fresh for a longer period of time. Zero temperature compartment: the temperature is kept close to 00C maintaining optimal humidity level. Fresh food compartment: it is designed to maintain and keep perishable food freshness for a longer time. The temperature in this compartment is lower by 2-30C than in other compartmens, so fruits, vegetable or meet freshness, aroma, color and quality will be kept much longer. Active air ioniser: neutralises bacteria and viruses that multiply inside the refrigerator thus ensuring an antibacterial effect. Antibacterial features: door handles, seal guards, inner walls which are coated or impregnated with antibacterial agents protects appliances against bacteria, their accumulation and reproduction. Economical function: when the refrigerator doors are opened less frequently and settings are not being changed, for example during vacation time, the program determines optimal temperature and saves energy consumption. Controlled humidity in the vegetable drawer: with the help of regulator humidity can be controlled depending on fruits and vegetable storage conditions (humidity up to 50% is the most appropriate storage for fruits and up to 95% - for vegetables) thus ensuring that food will keep all the vitamins and nutrients. Variable purposes compartments or appliances: enables to increase the capacity of fresh food and drinks storage during the summer, then change to greater capacity for frozen food in winter. The temperature is regulated from -240C to +40C over a relatively short period of time. Brands: "Beko", "Blomberg", "Gorenje", "Snaigė".